I love pasta and so do the two boys (viz. hubby and son). Everytime I go to the pasta aisle, I invariably spend a great deal of time trying to figure out which pasta to choose, from the large variety of shapes, sizes and nutritional content. On one such confused shopping venture, I happened to see a box of fun-shaped pasta. I had been looking for this at Trader Joe's - specially the ABC pastas, since my son has started recognizing some letters now. Unfortunately, Trader Joe's didn't have them. So I was happy to see this particular pasta box with butterflies in Safeway and picked it up. I couldn't wait to make the 'beefaay's and see the look on my son's face! Only after coming home did i realize that along with butterflies the box also had some other bug shapes (uh-oh). Luckily my son recognizes just the butterflies and wouldn't think much of the others. I put together a couple of veggies and some cheese to make the sauce. Well, I cannot actually call it a sauce, but I like it this way, since it would be great to pack it in his lunch-box when we go to the park or someplace where I can quickly feed him without worrying about the sauce dribbling all over. This is a quick and simple recipe. You could make your own variations and add more ingredients. Peel carrot and zucchini. Cook the pasta in salted boiling water, as per package instructions. Meanwhile, in a large pan, melt butter and add chopped carrots. While they are roasting, chop zucchini and add. Saute for a few minutes. Add 1 cup water (I used the water used to boil pasta). Cook for a few minutes till the veggies are completely cooked. Add cheese. Add the pasta to the sauce. Toss in salt, pepper and garlic powder according to the spice level your child can handle. Mix well and heat for 2 to 3 minutes. My son was thrilled to see the butterflies. The pasta lasted him for a couple of meals. And I couldn't resist a bowl myself! Sending this simple kiddie dish to this week's Presto Pasta Night, originally started by Ruth. Also sending this to Kids Lunch Box Treats. soooo cute...Not only kids, its a recipe for everyone! Apy, the pasta looks delicious. I liked the presentation. My little one loves pasta too..butterfly pasta looks cute..nice presentation! Cute looking pastas..kid's will definitely love this.. 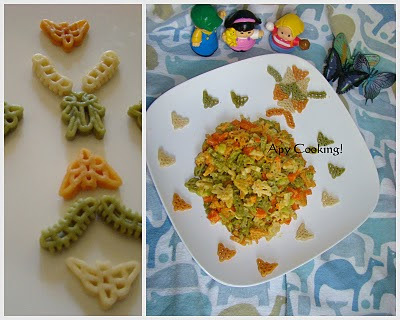 Such a great delight for kids, looks yum..
Those are cute and lovely pasta. Pasta looks wonderful, delicious, colourful and yummy. Very beautiful presentation. 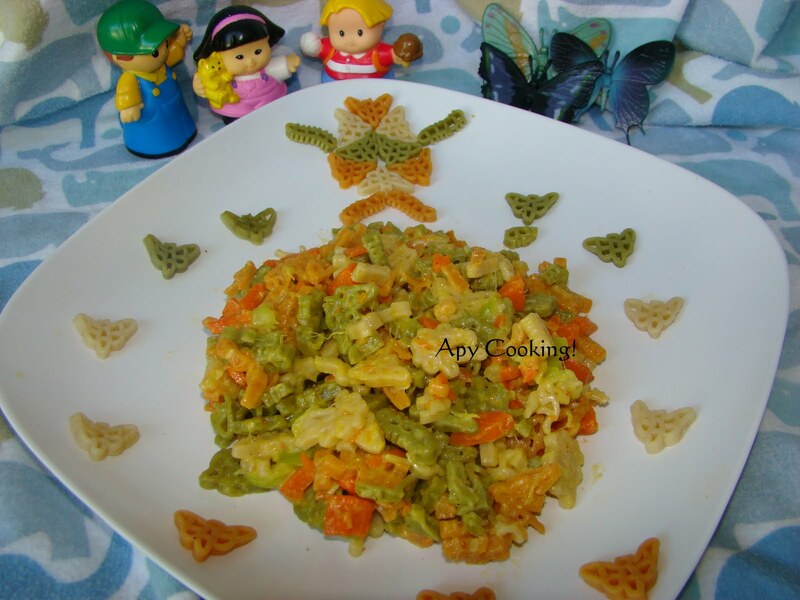 Such cute pasta and with veggies too. Ideal for the kids. Lovely! !Ideal for kids...N along with them i think i would be excited too when presented with this!! 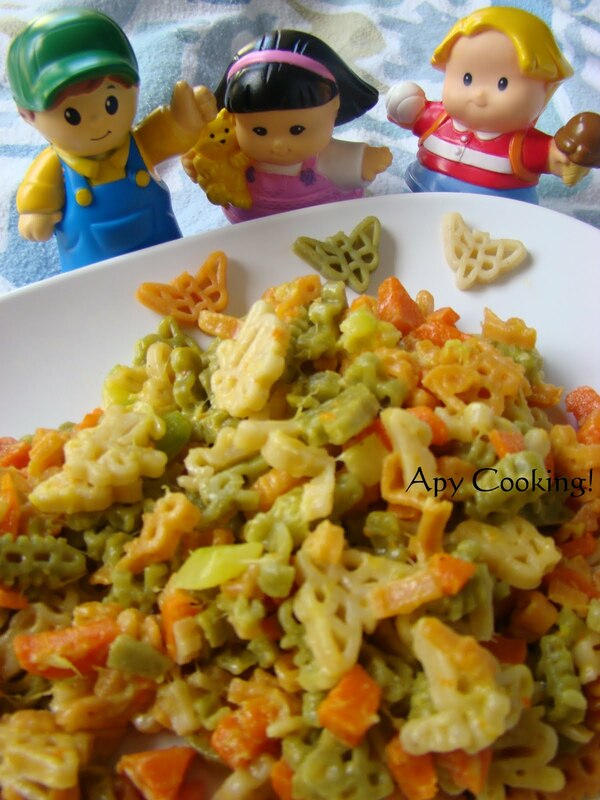 looks mindblowing dear........deliciously yum n mouthwatering...nt only kids ..i m craving for some now..
Cutie Pasta!! !Not only my kiddo but me too Wont mind a Bowl of it!!!! I think even big kids would love this dish. And I know my little grandsons will wolf it down. Thanks for sharing with Presto Pasta Nights. Any pasta on the menu this week? I'm hosting. 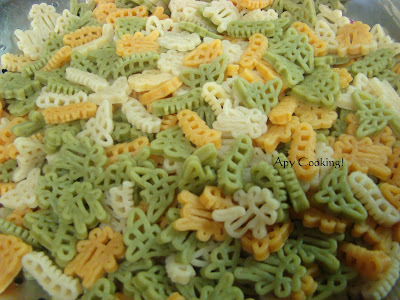 What is the brand that makes these pasta shapes?